BURBANK, Calif., September 11, 2014 /3BL Media/ – The Disney Worldwide Conservation Fund (DWCF)—Disney’s granting program focused on protecting wildlife and connecting kids and families with nature—has announced its 2014 conservation grant recipients. This year, $3.5 million in grants will benefit wildlife and habitats spanning five continents—from African lions in Tanzania and elephants in China to giant armadillos in Brazil and monk seals in Hawaii. African People & Wildlife Fund: Maasai Steppe Big Cats Conservation – To save Tanzania’s most threatened African lion population, the Maasai Steppe Big Cats Conservation initiative works with local communities to mitigate lion-livestock conflict through developing sustainable livestock enclosures (living walls of plant materials), protecting vital big cat habitats and educating local citizens. International Fund for Animal Welfare: Sharing Space with China’s Elephants – This program works to ensure that wild elephants can once again thrive in the Yunnan province of China by collaborating with local communities to provide the means and incentives to engage in protection efforts and assisting the government to develop conservation initiatives. Zoo Conservation Outreach Group & Instituto de Pesquisas Ecologicas (IPÊ): Giant Armadillo Conservation Project– The first long-term study of the giant armadillo, this program uses technology like satellite transmitters and camera traps to better understand and protect this species in the Pantanal and Cerrado regions of Brazil. This past year, the armadillo was chosen as the mascot of the World Cup and this team is working to springboard that attention into meaningful community engagement around giant armadillos. The Marine Mammal Center: Hawaiian Monk Seal Healthcare Project – With less than 1,200 Hawaiian monk seals remaining, the goal of this project is to establish a state-of-the-art research, rehabilitation and education program to promote monk seal population recovery and inspire the local community to protect this critically endangered species alongside the National Oceanic and Atmospheric Association (NOAA). 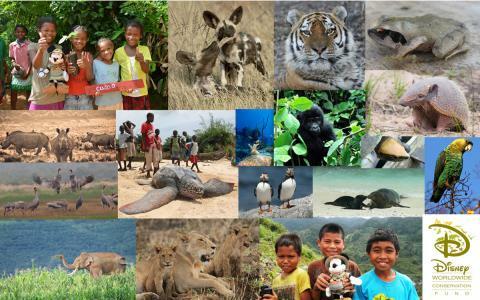 Funded efforts to conserve more than 400 species around the world. Funded projects that have protected 3,600 square miles of habitat—an area equal to nearly 60 Walt Disney World Resorts. Supported education programs that have engaged more than 3 million people in conservation efforts—roughly equivalent to the populations of Chicago and Atlanta combined. The majority of funding is provided by Disney but is supplemented by guest contribution opportunities at Disney’s Animal Kingdom Theme Park, The Seas and Land at Epcot, Disney Cruise Line, Disney Vacation Club Resorts, Disney’s Wilderness Lodge, Fort Wilderness and select Walt Disney World Resorts. For a complete list of 2014 DWCF grant recipients, click here.